Continuing my tradition of reading more Lovecraftian weird tales over the festive break, I thought I’d provide another run-down of the stories I’ve been enjoying in the third annual ‘Mythos delvings’ blog entry! The bulk of this year’s reading has been taken up with The King in Yellow, RW Chambers’ collection of short stories that revolve around the mysterious, diabolical play that has the power to drive people to insanity just by reading it. The book is a collection of ten stories that reference to a varying extent the play, and was published in 1895, when Lovecraft was just 5 years old. The stories vary considerably, but I have to say that my stand-out favourite is the first, The Repairer of Reputations. It’s a story that has all of the hallmarks of the classic weird tale, with a narrator that slides into insanity over his perceived rank of the King of Carcosa. The story has got an element of early science fiction to it, set in 1920s New York and contains startling reference to America’s victory over Germany in a world war, as well as describing America as having produced a nobility following some kind of cleansing of foreign elements. A particularly morbid aspect is the legalisation of suicide, and the story involves the opening of a “lethal chamber” where folks can go to kill themselves with ease. We follow the narrator, Hildred Castaigne, as he seeks to secure his succession as king in the Imperial Dynasty of America, with the help of the eponymous Repairer of Reputations, Dr Wilde. Hildred seeks to remove his cousin Louis from the “succession”, but is thwarted and cast into an asylum, where he dies. The story is an excellent study in weird fiction, and the horror comes out as we see Hildred slowly spiral into madness. There’s an excellent description of a mechanical safe that he uses to store his diadem, but which Louis dismisses as a biscuit box, and I’ve subsequently read that the lethal chamber could actually be a subway station, as seen through the deluded eyes of Hildred. It’s certainly one of the best short stories I’ve read in a long while! While I did like the stories in this book, it was more because I’m a longtime Lovecraftian gamer, and so got to see who these people are who turn up in the games, such as the aforementioned Hildred Castaigne, Jeanne d’Ys, et al. However, it has very little in common with the Mythos overall, except for the odd exclamation about the lake of Hali and whatnot. Hastur is just another of these exclamations, and it doesn’t feel like Chambers really had any sort of idea for the concepts other than throwing them out as weird-sounding stuff. Of course, Lovecraft used the word as well, without much expansion, and it was August Derleth who eventually turned him into the elder god that we gamers are familiar with today. The concept of The King in Yellow as a play that causes insanity is interesting, but again, isn’t really fleshed out other than mentioning it offhandedly. It’s something very similar to Lovecraft’s own Necronomicon, which also causes madness in its readers, though I do feel that Lovecraft provides more meat for those bones. Perhaps it’s just my over-familiarity with Lovecraft as opposed to having just last week read Chambers. We’re off to Kingsport for the next couple of stories, starting with The Terrible Old Man, which tells of an attempted robbery on one of the denizens of the town, only for the robbers to disappear, turning up as mutilated corpses in the sea. The story is nice and short, and has just the right amount of suspense and creepiness to it that makes it delightful. The Strange High House in the Mist is almost a sequel, dealing with the philosopher Thomas Olsen’s intrepid exploration of the strange house of the title. Olsen is hosted by the weird occupant for several hours, as he talks of the past and whatnot, before having a fantastical encounter with the god Nodens. Olsen returns to Kingsport, but even the Terrible Old Man notices the difference in him. It’s an odd story, again fairly replete with lore for an enthusiastic Arkham Horror player! The Horror at Red Hook is a tale I’ve read before, and features our good friend Thomas Malone from the Arkham Horror base game. The story details some black magic goings-on in the Red Hook area of Brooklyn, and revolves around the strange case of Robert Suydam, who is revealed to be an occult practitioner using magic and human sacrifice to retain his youth. As one does. The story is interesting to me, as it features a police inspector as the main protagonist rather than the usual idle intellectual; I’ve mentioned before how many of Lovecraft’s stories usually derive their horror from the fact that these intellectual types are at risk of losing their mind, a much more valuable commodity than physical harm. The story is an interesting one, though does suffer from some of Lovecraft’s strident racism. As with most of these things, though, I read them for the enjoyment of seeing stuff from the board/card game universe. The Rats in the Walls is another that I’ve read before, and reminds me of a somewhat disastrous date I was on back in 2011 or 2012. The story, anyway, is set in England, in the wonderfully gothic “Exham Priory”. The tale basically deals with rats in the walls, which prompt the unnamed narrator to dream of his family’s ancient and morbid history. Basically, the De La Poer family kept human cattle in an underground city to serve as a stock of flesh to satisfy their cannibalistic urges. The narrator, following an expedition into the lower levels of the house, goes insane at the revelations of his family’s history, and is committed to an asylum, shortly after which the Priory collapses. It’s got perhaps more of the gothic horror to it than the more usual cosmic horror, though we do get a gasp of Nyarlathotep towards the end. The expedition under the Priory has all the suspense of classic Lovecraft, however, and the physical descent beneath the foundations nicely mirrors the figurative descent into the family history – and into madness. I’ll finish with The Shunned House, which is another of these classic horror story types that Lovecraft does so well. The unnamed protagonist becomes fascinated by the history of a house on Benefit Street in Providence, RI. Along with his uncle, he looks into the history of the Harris family, and discovers all kinds of peculiar goings-on with the members of that family. Turns out the house is built on top of the burial site of a French daemon-worshiper, who has been leeching the souls of the house’s inhabitants since the eighteenth century. The protagonist and his uncle spend the night in the cellar, and his uncle is claimed by this diabolist, leading the protagonist to pour a load of sulfuric acid into the hell-pit, cleansing the house. The story is just great, with the sort of increasing build-up of suspense that Lovecraft does so well. It’s a straight-up ghost story, without any of the cosmic horror attributes of the Cthulhu mythos around it, but even so, it’s definitely worth having a read! Continuing with my tradition of reading Lovecraft at Christmas, I thought I’d present another little look here at some of the tales that I’ve been enjoying this year! To start with, I’ve had a look at Under the Pyramids, a tale ghost-written by Lovecraft for Harry Houdini in 1924. My main reason for this was the purchase of the expansion to Eldritch Horror for Christmas, but I wasn’t really sure what to expect. The story isn’t too bad, a classic Lovecraftian story that sees the protagonist (Houdini himself) exploring Egypt on his way to an Australian tour, only to be bound and gagged by a band of Arabs and dropped into a cleft in the earth. Being Houdini, of course, he manages to escape, whereupon he wanders the dark corridors underneath an ancient temple, and encounters the horrible mutant-mummies worshipping the fearsome monster that inspired the building of the sphinx. Lovecraft’s usual protagonists tend to be bookish professor-types, so having the celebrated magician is a novelty. Overall, a fairly enjoyable tale, though I can’t say it was as good as some of Lovecraft’s other stories. Despite an obvious knowledge of Egypt, I feel that the attempt to superimpose his usual brand of cosmic horror onto an established culture fell a little short. Continuing with reading the “collaborations”, I’ve also taken a look at The Horror in the Museum, one of Lovecraft’s “revisions” to a story by Hazel Heald. This story is a curious beast, describing the protagonist Stephen Jones as he accepts an offer to spend the night in the waxwork museum of George Rogers. Rogers attacks Jones, before being himself killed by the elder god Rhan-Tegoth, to whom Rogers had been sacrificing his “guests” for years. The story ends as Rogers becomes another exhibit in the museum. I say it’s a curious beast because the inclusion of the elder god seemed a bit strange, almost forced, when considered around the story of the museum. However, it’s an enjoyable-enough story, and one that fans of Lovecraftian boardgames will no doubt appreciate for its tale of Rhan-Tegoth, who was featured in Innsmouth Horror. I also feel that it’s something of an important story in the wider terms of the mythos – Lovecraft made his living through revising other peoples’ work as much as selling his own to magazines such as Weird Tales, and this story seems to be one of the more prevalent ones. The contents of the museum are equally like a roll-call of the mythos, featuring statues of Night Gaunts, Chaugnar Faugn, and Cthulhu himself. Back to Lovecraft’s own work now, and let’s start with Cool Air. It’s a fairly creepy tale, while remaining quite innocuous at the same time. It tells the story of a chap who moves into an apartment in New York underneath a doctor, and the two hit it off after the narrator is treated for a heart attack. The doctor lives in an apartment that is entirely refrigerated, and when the system breaks down, it eventually transpires that the doctor died 18 years previously, and had managed to cling on to life by keeping his apartment so cold. It’s a fairly straightforward story, and to some extent you can totally see the end coming. But yeah, it’s certainly an interesting story. While Cool Air might seem less like a Lovecraft story simply because of its lack of mythos-related stuff, Pickman’s Model is certainly more on track. We follow the narrator, Thurber, as he visits his artist friend, Richard Upton Pickman, in his Boston studio. Pickman is famous for his grotesque faces, much like Goya, but part of this story involves a visit to his basement studio, where the proceedings are interrupted by a weird scratching sound. Pickman discharges a revolver at whatever it is that makes a scratching, while the narrator checks out Pickman’s latest work, a diabolical image, the model for whom apparently exists as a real entity. It’s the usual suspenseful story with a mind-bending denouement, as the narrator finds a photograph of a monster Pickman was using to paint the work from. It’s a short, yet really good story, one that I can definitely recommend. Pickman himself is figure so closely connected to the mythos in the boardgaming world that I was just as excited to finally learn about as for reading the story on its own merits! Beyond the Wall of Sleep involves an intern at a mental hospital where a murderer is brought in, who turns out to be having some disturbing dreams. The intern uses some telepathic radio equipment he built in college to try to communicate with the man, and learns he is playing host to an extra-terrestrial being. It’s an interesting story, with some really interesting ideas, though it does seem a little off somehow. I think the idea of strapping these radio things to their heads and communicating telepathically is a bit goofy, but the whole thing about a patient at an asylum being possessed by a star-being is very Lovecraftian, and very much in keeping with the whole gothic horror stuff. Definitely worth checking out at least the once. Returning to Eldritch Horror tie-ins, The Outsider is a curious tale that seems to recount a dream, having a healthy dose of horror and non-sequiturs. The Outsider of the title narrates a tale of loneliness, as he lives alone in a vast, crumbling castle. One day, he climbs to the top of one of the towers, where he enters a strange, marbled world of an old churchyard. Exploring his surroundings, he finds a strangely familiar castle, full of the sounds of revelry. However, upon climbing through the window, the revelers scatter in terror. It turns out there’s a disgusting abhuman creature in there. The twist is that he was looking in a mirror, of course. The story is one of Lovecraft’s most-reprinted, apparently, the dream-like quality accounting for reams of commentary. I quite liked it, for my part – the twist at the end is masterful, explaining a lot of the earlier dream-like story and tying it all together quite neatly. At the end, a couple of references are made to Nephren-ka and Nitocris, the latter having appeared in Under the Pyramids in the underground chamber scene. Finally, and something of the main event of this season, was The Haunter of the Dark. Lovecraft wrote this story in 1935, in response to a letter in the Weird Tales magazine that suggested he wrote a story killing off the author Robert Bloch (author of Psycho, among other things), who had himself killed off a Lovecraft-inspired character in his own story, The Shambler from the Stars. The author Robert Blake moves to College Hill in Providence, RI, and is drawn to the steeple of an old church he can see across town. He investigates the dilapidated church, discovering a curious stone among some other occult artifacts, along with the classic Lovecraftian library of books such as the Necronomicon and Unaussprechlichen Kulten. Following this expedition, Blake comes increasingly under the spell of a mysterious entity that only comes out in the dark. After a series of storms knock out the electricity in the town, some sinister activity at the church precedes the discovery of Blake dead, presumed of electric shock. This one is what I would call classic Lovecraft. The suspense that comes through as Blake explores the church, then the tension during the night of storms – it’s all just classic gothic horror! A great selection this time round, I have to say! Let the Dark Waters flow! 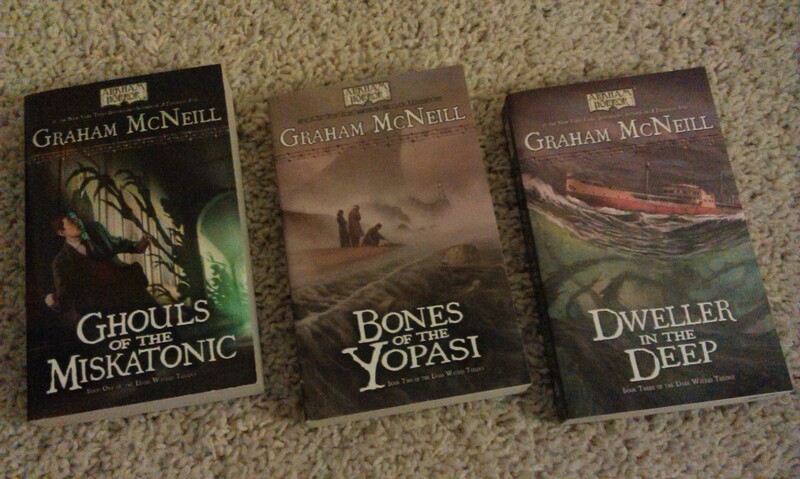 As the night draws in, I thought it’d be fun to take a look at a great little trilogy from one of my favourite genre writers, Graham McNeill – it’s the Dark Waters trilogy! 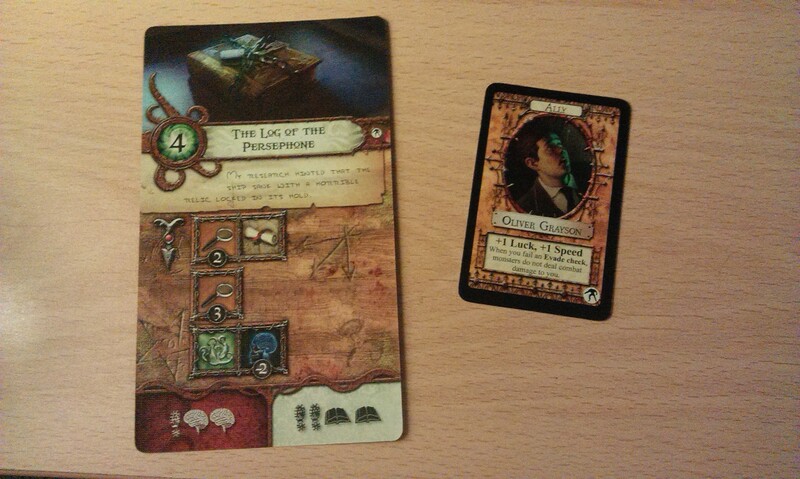 Released from Fantasy Flight Games between 2011 and 2014, the trilogy takes place in the Arkham Horror universe, and features characters from that game as well as introducing a new, central character Oliver Grayson, a professor at Miskatonic University. The series follows him on the trail of a mystery that starts with the disappearance of some female students on campus, and uncovers a plot to destroy the world. A nice touch, I thought, and well worth getting if you enjoyed the books. Which leads to a weird kind of cyclical argument for recommending these things. Most of the people who bought these books, I gather, did so for the cards on offer, without reading them. However, I’d say that you’d get more out of seeing these things come up in-game if you’ve read the books. The books are a great adventure romp set in the world of Arkham Horror, a bit like a cross between Indiana Jones and Buffy the Vampire Slayer (specifically Reptile Boy from season two) though perhaps a more suitable comparison could be Jules Verne’s ‘gentlemen adventurers’. It’s certainly an enjoyable trilogy, much more straightforward fun than Lovecraft’s cosmic horror. Author spalanzPosted on October 31, 2015 Categories LovecraftTags Arkham Horror, Halloween, LovecraftLeave a comment on Let the Dark Waters flow! I’ve mentioned Lovecraft quite a few times on this blog since it began, most often it seems in relation to a board game or other. However, I’m also a big fan of his writing for its own sake, and not just the inspiration for some awesome games! For a number of years now, it’s been something of a tradition for me to read a couple of the weird tales over the festive period, stemming back to the time I read The Shadow over Innsmouth by the light of the tree. Fantastic times, I must say! So I thought I’d ramble on a bit today about those tales I’ve been enjoying this festive break! To start with, I read The Dreams in the Witch House. There are some aspects of the Arkham Horror board game that I’ve been intrigued by, as I hadn’t come across them in my survey of Lovecraft, and the Witch House is one of them. In this short story, we see less of the cosmic monster-gods, and more of the almost mundane-by-comparison witchcraft. Though this is still Lovecraft of course, so it’s got that wonderfully gothic twist. We also get to see a lot of Arkham, as the story follows Walter Gilman’s traumatic experiences lodging in the witch house. It’s a pretty good story, anyway, and while it deals with an ancient witch rather than Cthulhu or Shub-Niggurath, it’s still unmistakably Lovecraft. Critics have judged it harshly – one putting it on a par with The Thing on the Doorstep as one of his worst, but then I really liked that story, too! The arrival of Mountains of Madness this Christmas had prompted me to look more into the origins of Ithaqua, one of those stalwarts of the mythos pantheon as far as the games are concerned. I’ve therefore spent more time this year reading non-Lovecraft mythos fiction than ever before, starting with August Derleth’s The Thing that Walked on the Wind. Derleth was a correspondent of Lovecraft’s, and has come under much fire for his treatment of Lovecraft’s work after the latter’s death in 1937, principally for his meddling with Lovecraft’s Ancient Ones into an almost religious pantheon. For all the criticisms, however, we owe Derleth an debt of gratitude for preserving Lovecraft’s work from the obscurity that may well have befallen them. 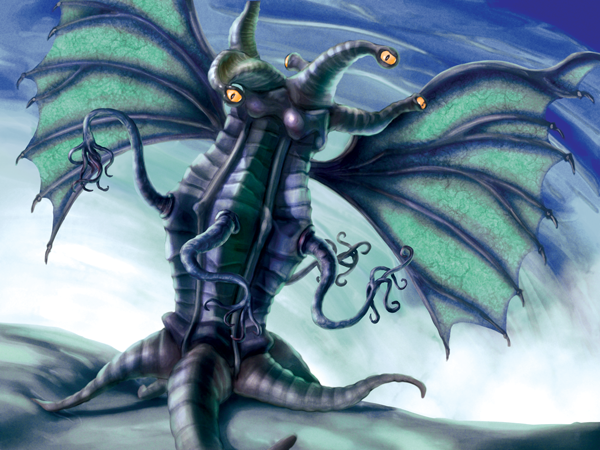 Derleth created the deity Ithaqua as a sort of ice/wind elemental spirit, thereafter trying to shoe-horn Lovecraft’s gods into similar positions (Cthulhu as a water spirit, for example). The Thing that Walked on the Wind is quite a chilling tale (pun intended) that deals with the bizarre goings-on in the far north. Derleth later reworked the story as The Snow Thing, which is, as you might therefore expect, basically the same story, though with a little more detail this time. However, there is an overriding feel to this version akin to the Bayou investigation that forms (if I remember correctly) the second section of Lovecraft’s Call of Cthulhu. An investigation into disappearances reveals a primitive cult of an ancient godlike entity, this time among the snow rather than the swamps. That shouldn’t detract, of course, and they’re actually interesting stories in their own right. Derleth was inspired by the Algernon Blackwood tale The Wendigo, which is the first tale in the Ithaqua cycle omnibus. A short story that deals with a hunting party in Canada, there is a classic suspense feel throughout this one, and it’s tempting to suggest it is superior to Derleth’s efforts on this basis. However, Derleth has the pulp charm working for him. Blackwood’s story is based on the Native American legend of the snow-beast, and while the majority of this story uses suspense, we do have a pretty horrible sequence just before the final denouement. It’s a classic tale, and definitely worth digging out if you can! Tales like the Wendigo show that stories of suspense can be more effective than the classic style of horror story, full of monsters and dismemberment. However, we’re back to Lovecraft now for another subgenre, the dream-fantasy. I read four of what are termed Lovecraft’s “Dunsany tales”, named after the Irish Lord Dunsany, the fantasy author of the Pegāna stories. There is a distinctive sort of charm to early, pre-Tolkien fantasy – Robert E Howard’s Conan stories also fall under this bracket, of course. While I’ve not yet read anything by Dunsany himself, I get the impression that his stories have the dream-fantasy quality, where the tinge of horror comes from the fact that a presumed sane individual is experiencing things that are, by all accepted laws, impossible. 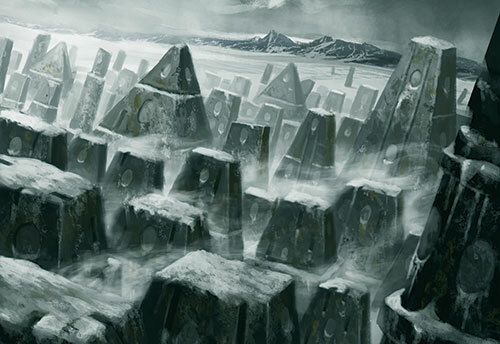 The story is very strongly reminiscent of the central episode of At the Mountains of Madness, with a trip through ancient ruins and bas-reliefs depicting the history of a vanished race. Reference is also made to Lovecraft’s earlier tale, The Doom that came to Sarnath. A story about a once-great city and its downfall, I felt a strong impression of parallels to ancient Rome here, though the Biblical history of Babylon appears as a strong reference. Again, this tale abounds in references to later works, notably The Quest of Iranon, which I found by turns to be fairly shocking! It has that formulaic pattern to the narrative that evokes the oral poetry tradition of ancient times, which definitely adds to the feel of the tale. The final story in this quartet is Polaris, which is very short, but important for being the introduction of another of Lovecraft’s ancient tomes, the Pnakotic Manuscripts. I found Polaris to be almost too-fantastical, if I’m honest, which made it hard to follow at times. All of these tales are commonly part of the Dream Cycle, an almost-infamous term in the mythos that is more strongly applied to the later works, starting with The Dream-Quest of Unknown Kadath. I have yet to read the Dream Cycle, so that’ll likely be one for next year! I’ve got another week off coming up, so there’ll be lots of excitement to come! But first, a brief look at the exciting things that have been happening in the past week! Yes, some completely unexpected news here from Fantasy Flight Games, who announced the standalone Star Wars card game on Thursday. Essentially a re-skin of the old Cold War: CIAvsKGB card game, it uses movie stills rather than original artwork. I quite like Cold War, as it’s a nice, quick game that is really fun. It’s also pretty cheap (I picked Cold War up for under a tenner), so it’s hard to say no, really. The big and unexpected news this week came on Friday, when they announced Wave Five for the X-Wing miniatures game, but you can read all about that here. Moving away from Fantasy Flight now, there’s another game that I’ve been looking forward to for over twelve months now that has finally had some exciting news – I’m talking about Fallen, by Watchtower Games. A Kickstarter project, I backed this game back in June last year and was absolutely overjoyed to see it funded to the extent that it was (598%, in case you’re wondering). At the time, it was estimated to have a December release date, then that was pushed back to February this year, then it was “summer”, but finally things seem to have firmed up again. It seems that the company, for whom Fallen is their first game, has taken an almost OCD-like approach to making sure the game is absolutely perfect. Fine by me, as I wouldn’t want a sub-par quality game, but it just seemed to get a bit ridiculous what they were doing. JUST GIVE ME MY GAME, ALREADY! So after weeks and weeks and weeks of email updates telling us that the card quality just wasn’t quite right, or the inlay wasn’t sufficient, or whatever, we finally had the email I’ve been waiting for on Friday – the game is being sent off to the printer! At last! I’ve backed this game as much as I could afford, as I was crazy-excited to get it in my hot little hands, so I’m now really excited. Only two or three more months to wait! I haven’t mentioned my Star Wars reading of late. 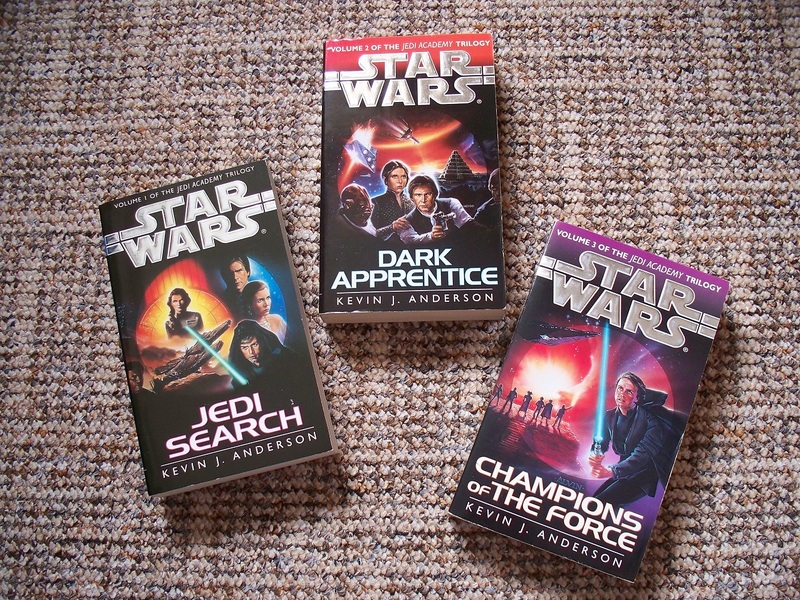 I’ve been reading the Jedi Academy trilogy by Kevin J Anderson, one of the earliest trilogies of Star Wars novels that I read. I have got to say, however, that I’ve not been enjoying it as much as I did when I first read it all those years ago. Primarily I suppose because it reads a bit too simplistically for me. Especially after the Zahn trilogy. While George Lucas had always said that he made the Star Wars movies “for young people”, the Jedi Academy trilogy seems to be aimed at an even younger demographic than George intended, I feel. When read in this respect, I suppose it’s not too bad, but otherwise, I do feel that it unfortunately misses the mark. Which is a shame, because I’m pretty sure I used to really like this trilogy! The storyline follows Luke as he attempts to rebuild the Jedi Order following the resurrection of Palpatine and the discovery of more Force users during the Dark Empire shenanigans. He finds a remarkably high number of Force users in a short period of time, considering they were supposed to have been wiped out, and establishes a base on Yavin IV. Soon, however, he discovers the long-dormant power of Exar Kun slumbering within the temples, and when an extremely powerful student named Kyp Durron arrives for training, things take a turn for the worse. Kun seduces Kyp to the Dark Side, and with his help he incapacitates Luke and goes on a rampage against the Empire. Han eventually talks him out of it and everything seems to be resolved by the end. In the course of these events, Han also stumbles across a secret Imperial weapons-development facility near Kessel, guarded by Admiral Daala, a protege of Grand Moff Tarkin and the only female flag officer in the fleet. Daala goes on a rampage of her own before realising her outdated tactics are ineffective and she basically rides off into the sunset (though she will reappear later…) Leia has her own storyline where she tries to bond with her children, is given more and more responsibility in the government until an ailing Mon Mothma makes her the new Chief of State of the New Republic. And Lando goes to a blob race. I’m not joking. The events of the trilogy are actually really important, and it’s almost required reading for any Star Wars expanded universe fan if you want to know more about what happens later in the saga. However, I just don’t like the execution! Luke seems to be paralyzed by fear – while it’s likely that he would embark on training an entire Order of new Jedi single-handedly with some trepidation, I don’t think the hero of the original trilogy would be this down about it all. Leia is also reduced to being some sort of caricature – gone is the strong leader we saw in the films, this is a Leia who can’t do anything without her husband. I also thought we got a bit too much, I dunno, kiddie-time, as she tries to connect with her twins (who are now aged 2) and whatnot. While this sort of stuff is all necessary for character and whatnot, it’s not really what Star Wars is all about. I get the impression that, if Anderson had still had Vader to write as well, we’d see the Dark Lord as he struggles with oiling the joints of his mechanical legs, or something equally mundane. Star Wars shouldn’t be mundane, but we get too much of it here. Kyp Durron…ah, what can I say? While every Star Wars author at this period seems intent on adding their own characters firmly into the storyline, most of the time this never really comes off. Tim Zahn’s additions of Mara and Karrde, Thrawn and Pellaeon just work, but there are others that just, well, don’t. Kyp Durron really rubs me up the wrong way, in a similar fashion to Corran Horn, who I’m sure I’ve mentioned before. Kyp is a teenager who has spent most of his life in the spice mines of Kessel, and when he declares some kind of aptitude for the Force he is tested by Luke and discovered to be absolutely amazing. Kyp turns to the Dark Side, flies around blowing stuff up, then it’s decided that actually, no, he didn’t turn to the Dark Side, but after a brief apology and some time spent looking more sullen than penitent, he is completely forgiven and, within the space of a few more pages, makes it to full Jedi Knight status well before any of the other students at the academy, who have been studying there longer. Basically, the impression I have is that Anderson loves Kyp Durron, and wants to put him into every kind of situation where he can show off just how awesome he is. The thing with him turning to the Dark Side feels like it was done just because Vader was a cool villain and Kyp needs to be cool, in a shimmery black cloak and crap. But then, no, he needs to be a Jedi so – I know, why don’t we say that it was actually Exar Kun who had such a powerful control over him, it wasn’t really Kyp doing all that bad stuff. So, uh, is Kyp so immensely weak that he can be controlled in such a way? Because, during Dark Apprentice, Kyp seemed to be pretty much in control of his own thoughts to me. Meh. It’s basically one of the worst Mary Sue characters in the universe. There are plenty more, of course – Bria Tharen instantly springs to mind – but perhaps the very worst part was the way Han was made to be his best friend/surrogate father. That just wasn’t the Han Solo we all know and love, no matter how much fatherhood might have softened him. I feel that there is a way for authors to integrate their own characters into the saga with the movie characters, but this is definitely not it. If we look at Zahn’s books, we get to know these new characters on their own first, before we see them with the others. Plus, these characters aren’t perfect people, they have flaws – even Grand Admiral Thrawn needs to take time to think things through, for goodness sake! Xizor is another good example, from Shadows of the Empire. We see him within his own organization, we then see him with Vader and the Emperor, and it just feels natural, to the extent that we almost feel like we’ve known about Xizor and Black Sun forever. But…Lando at the blob races… I just… urgh. I feel like my literary criticism is being a bit too harsh lately. First Dark Empire, now this, right?! I’m always really interested to see what other people think about these things, so please leave comments whether you agree or disagree with me! Author spalanzPosted on June 14, 2014 February 22, 2017 Categories board games, Lovecraft, Star Wars novelsTags board games, card games, Empire vs Rebellion, Fallen, Jedi Academy, kickstarter, Star Wars novelsLeave a comment on It’s post 49!